Turn a disk to aim the cannon, and then press the button to fire! Spin the thumbwheel to make Batman fly! Welcome to the Imaginext Batman Command Centre, where kids’ imaginations control the crime-fighting action, along with the Caped Crusader! Turn a disk to open the elevator door, and take the elevator to the control room! In the control room kids can turn a disk to aim the cannon, and then press the button to fire! They can make Batman fly when they attach him to the tether and spin the thumb wheel! 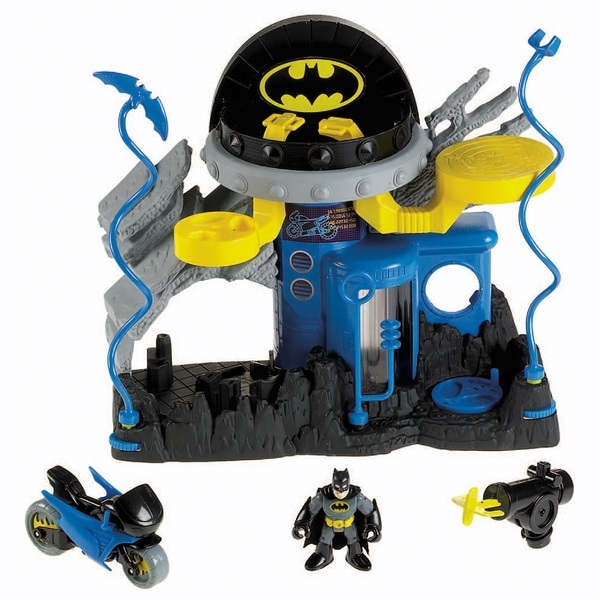 And when young crime fighters need to respond to trouble in Gotham City, Batman can zip away on his motorcycle!